The following newspaper articles, culled from various sources, offer a small glimpse of early aviation trials held in Newburyport, Massachusetts. Newburyport, Mass. – April 17. – Over the marshes of Plum Island, the Herring-Burgess aeroplane, “Flying Fish”, made three successful flights today. Arthur M. herring of Hammondsport, N. Y., piloted the machine in the first flight. After alighting easily at the river’s edge after a 250 yards’ run, the craft was turned over to W. Sterling Burgess, who made two short flights. The Salt Lake Herald-Republican, April 18, 1910. Newburyport, Mass., April 18. – Three successive aeroplane flights by A. M. Herring of New York and W. S. Burgess at Plum Island aviation field Sunday created a record for heavier than air machines when the big machine started on each one of its three flights by its own power in skids while resting on the ground. The successful flight is the culmination of three years steady planning by the two inventors who made the flights, which marked the opening of the aeroplane era in New England. Newburyport, Mass., May 13 – William Hilliard, and automobile racer of Boston, made three successful flights in a new Herring-Burgess aeroplane at Plum Island aviation grounds to-day. The machine he used had a new device of his own invention which supplanted the “fins” on the top, and is used to maintain the equilibrium of the machine. Several hundred yards were covered in each of the three flights, at a height of between fifteen and twenty feet, and during one ascension Hilliard was able to negotiate a complete turn, the first he has been able to make. 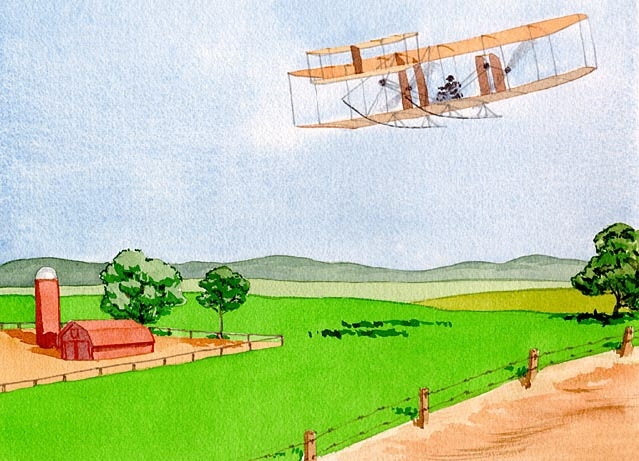 Newburyport, Mass., May 24 – The longest aeroplane flight in New England has been made by William Hilliard, of Boston, who went a distance of a third of a mile at Plum Island. The machine worked smoothly and no mishap happened. Newburyport, Mass., May 27 – Several aeroplane flights lasting an hour and a half and covering distances from a quarter to half a mile at an altitude of fifteen feet were made to-day by William Hilliard in a Herring-Burgess biplane at Plum Island aviation grounds. There was a brisk breeze blowing at the time, and it was thought at first the flights would have to be postponed until the air was calmer. Hilliard, it is said, jestingly made a vow last night that he would not eat again until he had made a flight, and he evidently was hungry this morning, for he launched the machine despite the breeze and flew across the meadows. The biplane has lately been equipped with a new device to give lateral stability. This device is intended especially for use in windy weather, and to-day it had its first real test. the inventor and Mr. Hilliard say that it worked remarkably well. New York Tribune, May 28, 1910, Page 5. Newburyport, June 8. Evidence that insurance companies are not to accept the risk of aviators as ordinary has been revealed here in the case of A. L. Pfitzner of Hammondsport, N.Y., who has been making flights at Plum Island. Pfitzner was visited by an agent of the insurance company Justas he was preparing for a trial of some new skids on a biplane today. The company had heard of the narrow escape of Pfitzner a few days ago when he crashed to the ground from a height of 30 feet. He was obliged to sign a clause absolving the insurance company from liability in case of death while engaged in flying machine flights. The Bridgeport Evening Farmer, June 8, 1910, Page 5. Newburyport, Mass., July 8 – A. L. Pfitzner, of Hammondsport, N. Y., made a very successful flight here today in a Burgess biplane, covering a distance of two miles at a height of 100 feet. Pfitzner started from the Plum Island aviation field and landed at Pork Island. The aviator said he could have gone farther but had to descend owing to his engne being overheated. This is the most successful flight at plum Island so far. 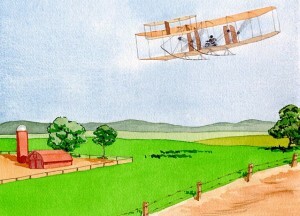 Mr. Pfitzner will make another flight this evening in the same machine while William Hilliard of Boston will also make a trip in his aeroplane. The Bridgeport Evening Farmer, July 8, 1910, Page 4. Newburyport, Mass., July 9 – Following a spectacular three mile flight across Plum Island meadows early today, A. L. Pfitzner, the New York aviator while flying at a height of 75 feet was hurled into Plum Island’s river when the machine which he was operating was capsized by a cross current of air. Mr. Pfitzner swam ashore and went to the aviation shed and an examination disclosed a badly bruised head and it is feared that he is injured internally. He plucklly stayed on the grounds until the remnants of the machine had been hauled from the river, after which he was driven to his quarters at the Plum Island Hotel, two miles distant. But little was left of his machine except the engine. he was using a Curtiss biplane at the time of the accident. The Bridgeport Evening farmer, July 9, 1910, page 2. Newburyport, Mass., July 9 – Following a spectacular three mile flight across Plum Island meadow today, A. L. Pfitsnor (Name misspelled – should be “Pfitzner”) of New York, flying at a height of seventy-five feet in a Burgess biplane, was hurled into Plum Island river. The machine capsized in air currents. It is feared he is internally injured. The Fairmont West Virginian, July 9, 1910, Page 6.